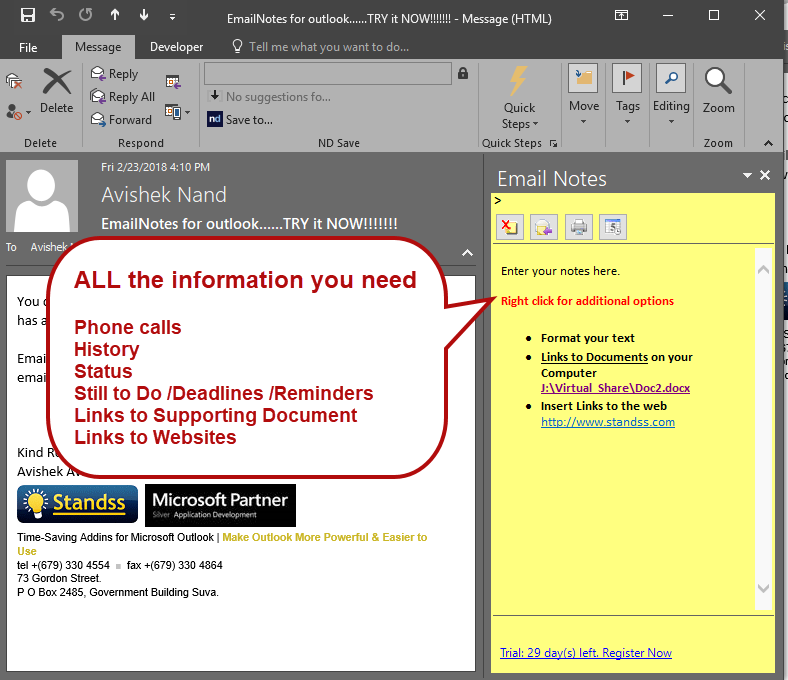 Get all the information you need right inside Outlook, right next to the email you are working on. Store valuable information with your email including your personal thoughts/ideas, phone conversations, history/status, reminders etc. The built-in intelligence system retrieves all relevant information for you and displays it next to the email! Store links to get immediate access to information outside Outlook, such as supporting documents on your computer, network or on the Web. No one else can see your notes and there is no chance of unintentionally sharing your notes with the wrong people. Your original email remains unchanged. Your notes are safe from data loss. Email Notes saves your notes in your main Outlook data file so that they are automatically backed up when you backup your Outlook data files. You can share your notes with others when you want by using the ‘Forward/Reply/ReplyAll with Notes’ buttons.